(CNN) “Serious plans for explosions” forced the evacuation of a stadium in Hannover, Germany, on Tuesday night before a Netherlands-Germany friendly soccer match, the police chief for Germany’s Lower Saxony region told Germany’s public broadcaster NDR. The soccer stadium wasn’t the only place in Hannover where people were worried about their safety. Hannover police posted on their Facebook page Tuesday night that they were examining a suspicious item in the area of the central train station. After partially evacuating the station, police determined the item was a fake bomb left by a passenger who had fled, according to CNN affiliate ARD. Police say they are evaluating surveillance video to identify the passenger, ARD reported. France and England went ahead with a friendly soccer match Tuesday night at London’s Wembley Stadium, which was lit up in blue, white and red to honor the visiting squad. Leading up to the game, London police increased their presence around the stadium and at several busy areas, such as transport hubs, across the British capital. 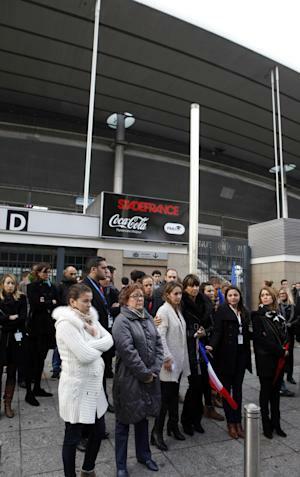 SAINT-DENIS, France (AP) — The suicide bombers’ explosive belts, packed with shrapnel, had been designed to kill and maim the crowds at the national stadium. But while their terrorist associates in the city center of Paris killed 128 people in gun and suicide bomb attacks, the three assailants who blew themselves up outside the Stade de France added just one more body to the overall count of 129. A combination of solid security at the huge arena, quick thinking in a crisis, modern stadium infrastructure and apparent mistakes in the attackers’ planning appears to have averted a massacre. That suggests the host of next year’s European soccer championships, which are expected to draw millions of fans from far and wide, is as well-equipped as any nation can be against such viciousness. The stadium, much loved because it was there that the national team won the World Cup in 1998, was the first target hit on Friday night. It was packed with 79,000 people watching France beat Germany at soccer. Had the suicide attackers gotten inside or, failing that, blown up outside among crowds before and after the game, they would have been more murderous and caused even more panic, further overloading Paris hospitals and rescue services scrambling to treat hundreds of casualties with battlefield wounds from the city center. Instead they exploded outside, during the match, when the stadium surrounds were less crowded. One of the explosions was in a lonely dead-end street 500 meters away. Only the first blast was deadly, killing a bystander. There also were several dozen injuries. At least one of the attackers tried to get in, despite not having a ticket, but was turned away, said an official who spoke on condition of anonymity because he wasn’t authorized to publicly discuss the complex and fast-evolving investigation. One police theory is that the attackers never expected to get inside, knowing they likely wouldn’t get past security pat-downs with their suicide vests, and instead planned to detonate as people filed in before kick-off or filed out after France’s 2-0 victory. But their timing may have been off, officials say. When they triggered their vests — two during the first half of the match, the third at half-time — the bulk of the crowd was safely inside, enjoying itself. Still, as chaos unfolded, authorities decided spectators would be safer kept inside and the match went on. That decision was taken by President Francois Hollande, in consultation with French Football Federation officials, the presidential Elysee Palace says. Bley Bilal Mokono, who arrived late at the game with his 13-year-old son Ryan and a friend, believes he saw one of the attackers — “a man with a beard and a gaunt face” — in the toilets of a restaurant opposite the stadium’s Gate D.
“His face was sweaty, he looked distressed, staring at the mirror in front of him with his hands on the sink,” Mokono told French broadcaster BFM. He saw him again outside, where Mokono had stopped to buy a sandwich. Then came a powerful blast. Mokono was hospitalized with a collarbone injury and damaged hearing. That first blast, which also killed the bystander, sent shrapnel and flesh whizzing through the restaurant and left a large shattered dent in its frontage of triple-layered toughened glass. Jeremy, a stadium security guard who would only give his first name for fear of losing his job, said he’d just arrived to help with the aftermath when the second blast went off minutes later, 200 meters (yards) away outside Gate H.
The third attacker, for reasons still unknown, waited another 23 minutes to trigger his vest, killing only himself, away from the stadium, next to a tree and a traffic sign in a side-road wedged between office buildings. The shrapnel shot bullet-like holes in windows and shattered glass in the cab of a parked truck. Back at the stadium, after the match, truck driver Abdelaziz Boucenna was thrown to the floor and trampled, breaking two fingers and bones in the wrist of his left hand, as people panicked as they were filing out. By then, word of the attacks had spread in the crowd. As Boucenna, his son and nephew neared an exit, they heard people yell, ‘he’s coming, he’s coming!” and imagined it must be an attacker. “I picked up our kid. I wanted to protect him. We were thrown to the floor. The crowd arrived like a wave. My fingers were all twisted,” Boucenna said. Boucenna’s nephew, Mohammed Chelay, said they were directed to the stadium infirmary. But when shown Boucenna’s fingers, “The woman took a look and said, ‘There’s nothing I can do,” Chelay said. He only gave his first name, Said. Stadium operators and one of the companies in charge of venue security wouldn’t speak to an Associated Press reporter who went Monday to their headquarters. The stadium will host seven matches, including the final, at Euro 2016. The president of the French Football Federation, Noel Le Graet, said security functioned well. BUCHAREST, Romania – Romanian Prime Minister Victor Ponta announced the resignation of his government Wednesday following huge protests in the wake of a nightclub fire that killed more than 30 people. “I’m handing in my mandate, I’m resigning, and implicitly my government too,” Ponta said in a statement. He said he would stay on until a new government is in place. President Klaus Iohannis will name a prime minister to form a new government, which needs to be approved by Parliament. If this fails twice, early elections will be called. Romania is scheduled to hold parliamentary elections in December 2016. The mayor of the district in the Romanian capital where the nightclub is located, Cristian Popescu Piedone, also resigned Wednesday, saying he is morally guilty for the deadliest fire in Romania’s history. Piedone said: “I assume the moral blame. As for the legal (blame) I will leave it to justice to pronounce.” He came under pressure to step down following mass protests through the city Tuesday night, with more than 20,000 demonstrators blaming widespread corruption for the deadly blaze on Friday night. Witnesses said the fire broke out during a heavy-metal concert in the basement club when a spark ignited foam decor, sending panicked people stampeding for the single exit. The death toll stands at 32, with some 130 still hospitalized, dozens of them in serious or critical condition. Thousands took to the streets the night before in a spontaneous protest calling for the resignation of Ponta, Interior Minister Gabriel Oprea and Piedone. They shouted “Shame on you!” and “Assassins!” and waved Romanian flags. Anger has been brewing for some time in Romania against the government, which many perceive as being corrupt, and Friday’s fire has added to the discontent. Even before the fire, Ponta had been under pressure from his oponents to resign, but had refused. He is on trial for corruption charges including tax evasion, money laundering, conflict of interest and making false statements while he was working as a lawyer in 2007 and 2008. At the time, Ponta was a lawmaker. He denies wrongdoing. Romanians had also called for the resignation of Oprea over the on-duty death of a police motorcyclist, who died after he hit a hole on Oct. 20. He was in a motorcade easing a route in Bucharest for Oprea. KANSAS CITY, Mo. – Critical health violations are up this season at Kauffman Stadium concession stands compared to last season. The Kansas City Health Department tells us inspectors plan to visit Aramark food stands at Kauffman during the World Series home games. As 41 Action News first investigated in May, critical violations at Kauffman Stadium have nearly doubled since 2012. “The Health Department food safety inspectors will continue inspecting the food service operations at the stadium during the World Series to ensure the food being served is safe. All violations in previous inspections have been addressed with the food management company. All critical violations have been corrected either on site or during follow up inspections.” – Naser Jouhari, manager with the Kansas City Health Department. Our previous investigation also found despite the increase in critical violations, no customers had filed complaints with the Kansas City Health Department. Since our report in May, the Kansas City Health Department tells us they have received two complaints about Kauffman Stadium but have not shut down any Aramark food stands. “Our team at Kauffman Stadium has worked closely with the Kansas City Health Department throughout the entire season to ensure the food we serve at The K is safe to eat. We are proud of our food safety record and look forward to continuing to provide fans an enjoyable dining experience during the World Series.” – David Freireich, Aramark spokesman. In a surreal scene, two fans rappelled from the upper deck during the Carolina Panthers’ game against the Indianapolis Colts on Monday night to protest Bank of America, and the company’s support of a planned liquefied natural gas facility. ESPN showed the fans during the second half, coming down from the second deck with a banner. Social media pictures of the fans revealed the banner that expressed opposition to Bank of America and to “Dump Dominion.” A media release from DumpDominion.org explained that the protest was against the bank’s “financing the planned liquefied natural gas [LNG] export facility in Cove Point, Maryland.” The Panthers play in Bank of America Stadium. The Charlotte Observer reported that four were arrested in the stunt. The report said that the four were David Baghdadi, Erica Madrid, John Nicholson and Angela Vogel, according to We Are Cove Point, an organization involved in the protest. The scene lasted a while. The protesters started to descend during the third quarter and hung by ropes “well into the fourth quarter,” according to the Associated Press. During the fourth quarter ESPN showed the protesters again, still hanging from the upper deck, and showed that some rows of fans in the section below the protesters were moved out of their seats for their safety. Law enforcement officers were in the upper deck above the protesters trying to figure out how to handle the situation. It’s an embarrassing moment for the NFL and the Panthers, who get millions from Bank of America for naming rights on their stadium. Carolina and all NFL stadiums have strict policies on what can be brought inside, so there will be many questions for stadium personnel of how two people got gear and a banner in. The “Monday Night Football” game, played in a rainstorm, wasn’t all that exciting for most of the evening (until the end). The protesters hanging off the upper deck added a different story line, though not one the NFL or the Panthers wanted.